Your referring to our feedback area will prove our trustworthiness. The extreme quality Chelics design chess set is beautifully hand carved chess set by our manufacturing unit in the city of Golden Temple Amritsar, India. 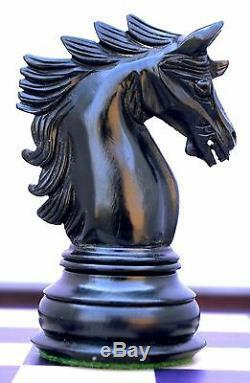 The high quality carved knight head makes this chess set a stunning design and this is the choice of Collectors and for the people who want to decorate their homes with beautiful handicraft items. 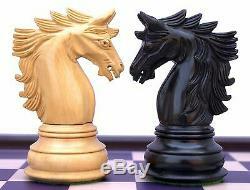 #The king height of this design is 4.3" and the base size is 1.875" #The material used in this chess set is Ebony and Box wood. #The set is triple weighted and green felted. #The recommended board is 2.125 square. The item "Chelics Series Premium Staunton 4.5 inch Chess Set in Ebony Wood and Box Wood" is in sale since Thursday, March 15, 2018. 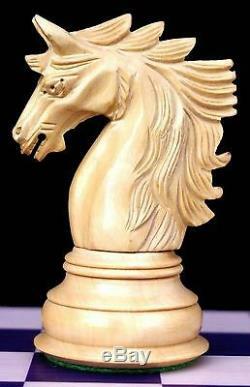 This item is in the category "Toys & Hobbies\Games\Chess\Vintage Chess". The seller is "staunton_castle" and is located in AMRITSAR, PUNJAB. This item can be shipped worldwide.